Five years and £100m to power transformational benefits for people with dementia. 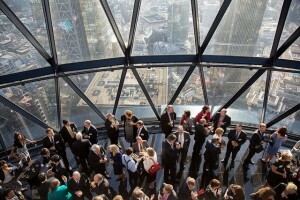 Last night at a special Alzheimer’s Research UK reception held at The Gherkin in the City of London, I had the pleasure of announcing the launch of our new campaign, Defeat Dementia. This major five year fundraising and investment drive will seek to raise at least £100m to fund a new phase of research that will provide real benefits for people living with dementia. We have an unprecedented opportunity to play a major role in the global fight back against dementia. We have an unprecedented opportunity to play a major role in the global fight back against dementia, and bring our expertise to bear in the drive for new treatments, preventions and improved diagnosis. The time is right for us to set out with this new ambition thanks both to the major scientific opportunities we can build upon, and the social and political impetus we have helped to build around dementia over the past few years. This week, Alzheimer’s Research UK was delighted to co-host the UK Government’s key legacy event, which was a central promise of the London G8 Dementia Summit held in December 2013. The event focused on how to create a step change in funding for dementia research and how to spend this money innovatively to find a treatment for dementia as quickly as possible. 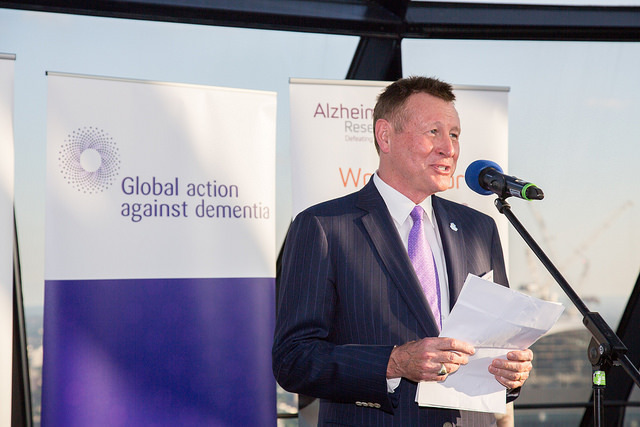 World Dementia Envoy, Dr Dennis Gillings speaking at the event. The Defeat Dementia campaign is our contribution to this movement, building on the fundamental understanding that we have amassed in scientific research in the last twenty years to move ever closer towards providing breakthroughs. As a charity we are uniquely well placed between the academic and pharmaceutical sectors to fast track discoveries into further industrial development ensuring that the journey for a promising idea between bench and bedside is made as quickly as possible. We will also draw upon our strong links with the international research community, Government, the financial sector and the pharmaceutical industry to develop new partnership initiatives to leverage further funding and to make our donors’ money catalyse ever greater action. We believe this campaign will deliver a step change in our response to dementia, supporting world-class scientists and organisations to deliver answers that will make a difference to people’s lives. Today we are announcing our Stem Cell Research Centre, supported by the Alborada Trust, as one of the first new developments emanating from Defeat Dementia. Read more about the centre. We will invest £30 million in a network of Drug Discovery Institutes, both in the UK and Europe. Developing drugs for complex diseases like Alzheimer’s requires a multi-faceted approach, bringing together basic science, clinical expertise and participating patients. Our Institutes will achieve all three by locating within leading academic establishments that have close links to clinical research units and hospitals. We will launch a ground breaking £20 million Global Clinical Development Fund dedicated to taking promising new treatments into testing in people, bringing them closer to the hands of people with dementia, sooner. The fund will enable innovative drug studies to take place working with carefully selected groups of people that will maximise the potential to see positive effects. The fund will create a new market of potential medicines that will in turn attract further pharmaceutical industry investment and significantly increase the probability of providing the treatments we need. We will introduce a new Prevention Fund to challenge the scientific community to answer the biggest questions in prevention, seed-funding the very best ideas. This investment is akin to the global fight against HIV/AIDS – a concerted effort that changed the landscape of research to achieve a singular ambition: rapid patient benefit. We will work with the UK Government and their Global Action Against Dementia initiative to influence other funders to join with us in these strategic efforts, catalysing even greater investment and focusing on developing the best possible treatments as quickly as possible. We’ll be talking a lot more about our campaign as its gets underway this year, announcing the launch of our major initiatives and updating on how you can get involved play your own part in the mission to Defeat Dementia. Our Chairman David Mayhew CBE is former Chairman of J.P. Morgan Cazenove and now Vice Chairman of J.P. Morgan’s global investment bank and former Chairman of Cazenove Capital Holdings Ltd. David is also a Trustee of the Royal Anniversary Trust which is concerned with the advancement of education for public benefit and a member of the Wellcome Trust Investment Committee. Besides excellence in his field, David also brings a strong personal commitment to driving forward the charity to support new breakthroughs in dementia research. Does Down’s syndrome hold the key to cracking Alzheimer’s? A closer look at a cannabis-based treatment in Alzheimer’s disease.